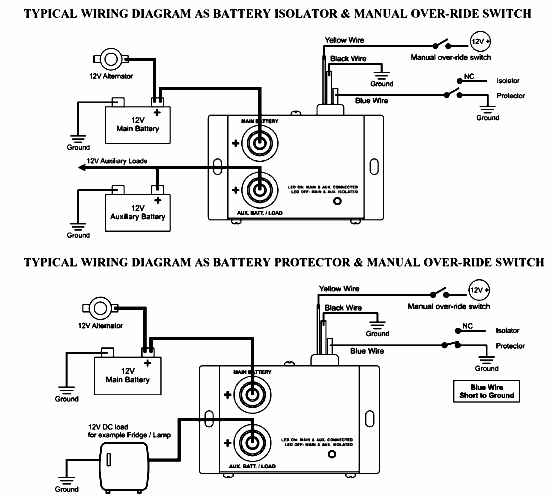 A Battery isolator (or split charge relay) allows an auxiliary battery or batteries to be charged by the vehicle's electrical charging system (the alternator), yet not participate in engine starting. A battery isolator also prevents the starting battery from being run down by your audio equipment connected to the auxilliary battery when the engine is off. The battery isolator is rated for 12 volts DC, and should be rated to equal or greater than the peak current output of your high output alternator in Amperes. The battery isolator is your answer to running a high current audio system with your engine off for extended periods of time, while remaining able to start your car's engine trouble-free to recharge your audio system's batteries, or even to simply drive home!